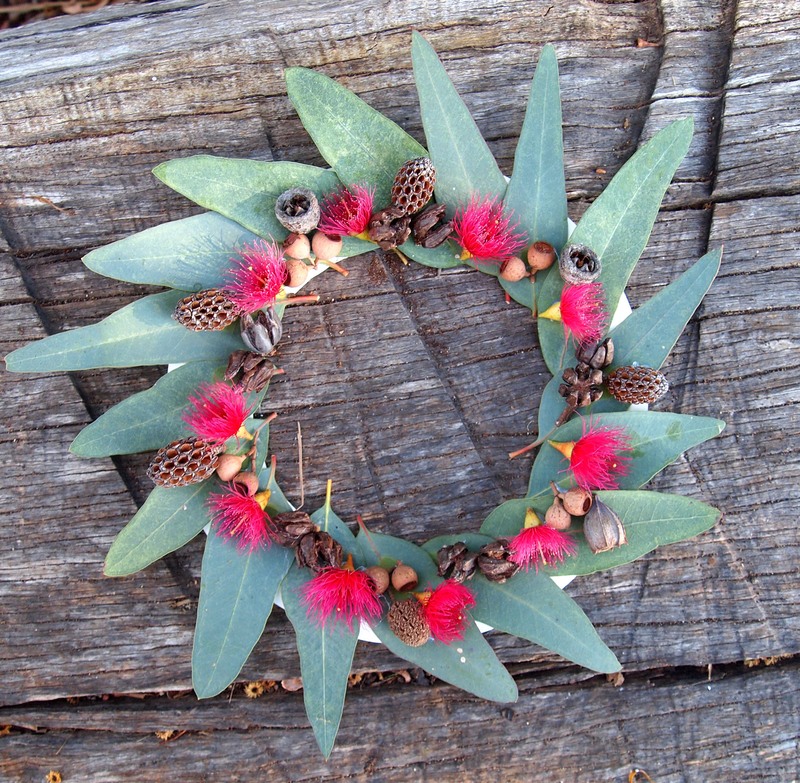 Large gumnuts are found on a variety of Eucalypts, and are fantastic for crafting. 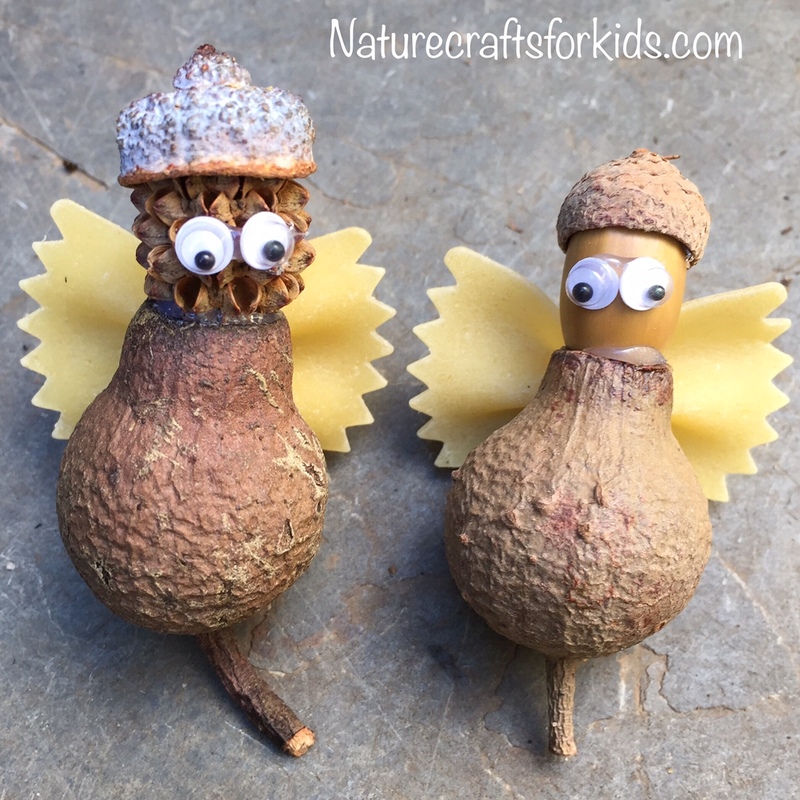 These little nature craft Christmas Angels have large gumnuts for their bodies, and bow-tie pasta wings. The Angel on the left has a sheoak head and gumnut cap hat, while the one on the right has an acorn head and acorn cap hat. Alternatively, you could use wooden beads for the heads. Little plastic eyes finish them off, and the pieces are glued together using a low-melt glue gun. If you’d like to hang them, glue a loop of string on the back. Making a Christmas reindeer out of seedpods and sticks is really fun and easy. This little one has a large gumnut (Eucalypt seedpod) for it’s body, and a sheoak pod for it’s head. Small sticks make perfect legs and antlers, and it’s all glued together with a low-melt glue gun. Small plastic eyes and a gumnut cap nose, painted red, finishes this little nature craft Rudolf off! Paper plates with the middle cut out make a perfect base for a wreath. And they’re cheap & easy if you’re working with a whole class of young kids. Head outside so the kids can collect some natural materials. I’ve glued on gum leaves, gum blossom and gumnuts to give it a very Aussie touch, but just use whatever plants are available. A very simple yet effective nature craft activity! 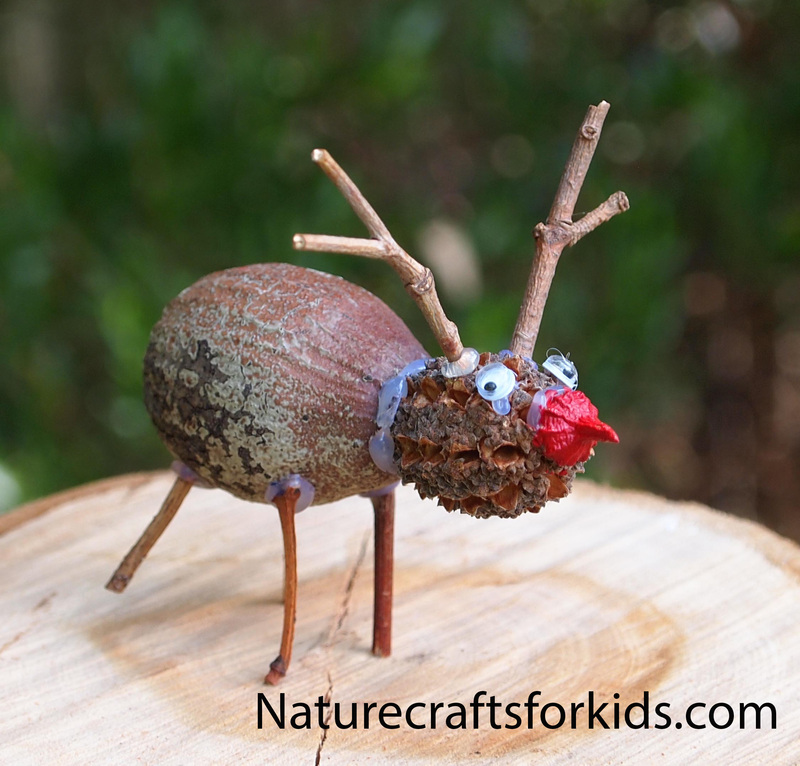 Here’s another easy Christmas nature craft which kids love. Collect some large gumnuts for the body and sheoak pods to make the head for your seedpod reindeer. Small twigs can be used for the antlers and legs. Glue them together with a low-melt glue gun to form a little reindeer. Add plastic eyes and a Coral Gum cap for the nose, which can be painted red to turn it into Rudolph. 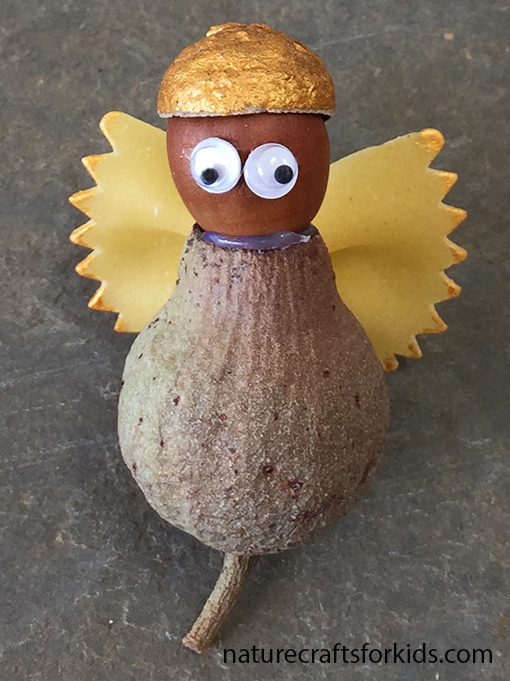 Here’s a simple angel decoration to get your Christmas creativity started. I’ve used a large gumnut for the body, with an acorn and cap for the head. Bow tie pasta is the perfect size and shape for wings. Use a low-melt glue gun to glue it all together, and add a dash of gold paint for some sparkle! Glue a loop of thread on the back if you’d like to hang it. Voila!